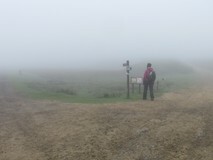 The Cleveland Way had been on our radar for a while, and reaching the shared finish marker when we did the Yorkshire Wolds Way in 2016 had prompted us to look at it a bit more closely. On the map it seemed like an interesting mix of terrain, so we got a trip lined up for the start of June. 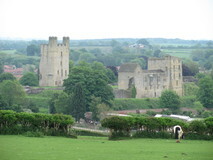 The only challenge was getting to the start at Helmsley. We tried to work out options to get there on Friday evening, but eventually settled for travelling up on Saturday morning and having a short first day. The train journey from London was grim, much busier than expected, standing room only all the way to York, but we finally made it to Thirsk, where we got a taxi to Helmsley. Just as we were adjourning to a cafe for beans on toast and a pot of tea, a torrential downpour started, which had everyone in the market square running for cover. As we tucked into our lunch there were rumbles of thunder and lightning outside. We finally got moving at about half past one, at which point the rain had passed over, and the sun was out again! We made our way to the stone sculpture at the start, and then got going. 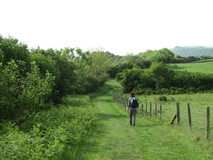 The trail started off on an easy track through grassy meadows full of buttercups and clover, and after spending the morning on the train packed in like sardines amongst angry travellers, it felt particularly green and peaceful, and it was great to finally be moving. 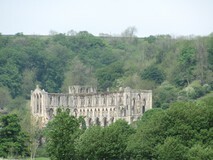 After more buttercup filled fields, and some nice sections of forest, there were views of the rather spectacular ruins of Riveaux Abbey, followed by a series of small lakes. By now it was quite hot in the sun, but as we pushed on along the swathe of grassy meadow flanked by tall trees in Flassen Dale, the sky started getting darker, and there were rumbles of thunder in the distance. Just as the rain was starting we reached a picnic area, together with a small hexagonal wooden barbeque shelter, complete with a resident plastic bird of prey, and we took refuge for thirty minutes as the heavy rain passed through. 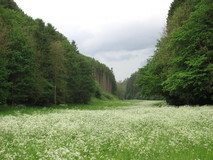 The sun was soon back out again, and the trail climbed out of Flassen Dale up a sunken track, with the sides thick with wild garlic. 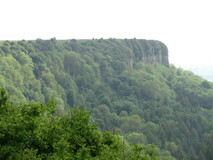 The guidebook mentioned a small hotel at Hambleton, where the route crossed the A170 near Sutton Bank, and we were looking forward to a quick drink stop, but when we got there it was all closed up, and looked like it had been shut down for quite a while. 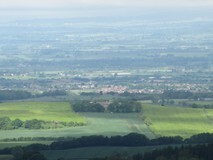 We reached Sutton Bank at five o'clock, and sat down on a bench for a while to take in the views before pushing on. We detoured off to the visitor centre in the hope that we might get a cup of tea to spur us on for the last section, but unfortunately it had already closed. To get back to the edge we followed a sign that said 'This way for the finest view in England'. Although it was still dry, the sky had turned rather dark, plus a chilly wind had started, so we had to stop and put fleeces and waterproof tops on to stay warm. 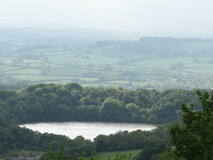 There were more great views as we walked along the edge, looking down at Gormire Lake, then past Whitestone Cliff and High Barn, before finally arriving at High Paradise Farm at half past seven. It was a good spot, there was a little cafe in the farmhouse that was still open, and a small fairly basic hiker camping area amongst trees. We pitched up and got the stove on for a brew, followed by noodles for tea. 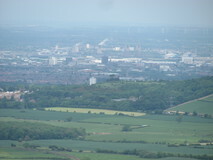 We were sharing the site with a few other walkers, plus a group of young people doing their Duke of Edinburgh assessment. After succumbing to the temptations of the cafe in the morning, we finally got going at about half past eight. 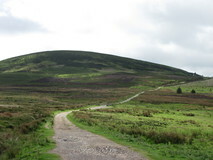 The route followed an old drovers road, firstly along the edge of Boltby Forest, then out across a gently undulating moor. Ahead we could see the drovers road snaking off into the distance. 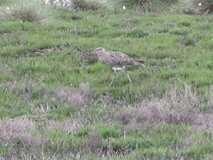 A few curlews circled round to inspect us as we passed, although they always landed just out of range for decent photos. 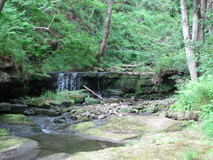 At the end of the drovers road, we dropped down a very pleasant green valley to pass a small reservoir at Oak Beck, and then shortly after we popped out in the centre of Osmotherley. At a small cafe we got a pot of tea, together with some excellent homemade 'sweet potato, carrot and ginger' soup. Osmotherley had the last shop for the next couple of days, so we went and stocked up with snacks for during the day plus evening meals. It was a very small shop, and the choice was rather limited, but we managed to find enough stuff to keep us going, including some instant cous-cous for evening meals, and ginger biscuits and plum cake for treats during the day. Before leaving the village, I took advantage of the public loo, which was twinned with a toilet in Burundi. On the way out of Osmotherley, the route passed a 'pinfold', which was an ancient enclosure used to impound stray animals, until an owner came and paid a fine. 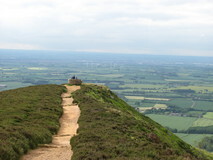 The path climbed away from the village, with views across the flatter terrain to the West. 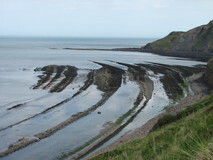 A little further on was where the Coast to Coast joined up with the Cleveland Way for a while, and I recognised it immediately from my C2C trip in 2011. 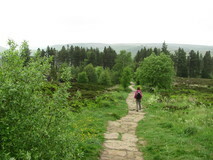 There was a nice stretch where it levelled out on the top, through mixed trees, before popping out at Scarth Wood Moor where the route then gradually descended on slabs, with great views ahead to the other moors to come. At the bottom of the moor it went into forest, and we stopped for a cake and builder bar in the shade. Along here we came across small homemade signs which were a black coffin shape with LWW written on them, for the Lyke Wake Walk. Easy walking through forest took us to a short stiff climb up to Live Moor, where the path then stayed up high, undulating across the moor. 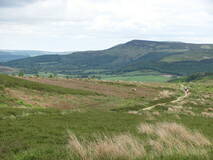 At the end of Cringle Moor, views appeared down to Carlton Bank, complete with an area where a number of paragliders were getting ready for take-off. We dropped down to the Lords Stones cafe and asked about the camping but as it was a Sunday night on a bank holiday weekend it was full up, so we got a quick drink before the cafe closed up, filled up our water bottles, and then pushed on. 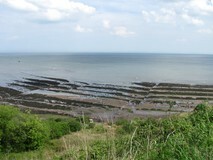 The climb from Carlton Bank took us to a small seat at Cringle End where there were excellent views, then continued along the edge. Fortunately there was another campsite in the next valley, which was only about ten minutes off route. 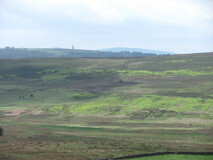 From the top of Cringle Moor we could see down to it, and it looked fairly quiet, there were only a handful of tents in the field. We got there about quarter to seven, and quickly got pitched up and got a brew on, followed by hot showers. The weather had taken a turn for the worse in the morning, there was low cloud hanging over everything and light drizzle, so we needed full waterproofs on from the start. 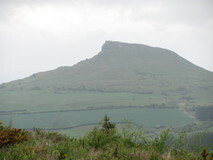 The jumbled gritstone lumps of the Wainstones appeared out of the gloom, and we stopped and had some plum cake for breakfast while sheltering from the drizzle under an overhang. 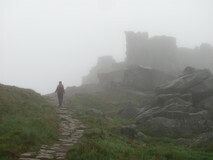 When I previously passed the Wainstones on the C2C, the conditions had been similarly gloomy, so I still haven't properly seen them in clear conditions. 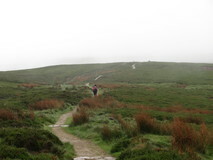 We pushed on and gingerly descended the wet rocky path to Clay Bank, a few fell runners overtaking us on the way down. 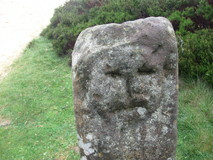 The path then climbed up to Urra Moor, which was a little bleak in the low cloud, although we managed to find the old milepost with a face on it, and another one with some crudely carved hands on it. 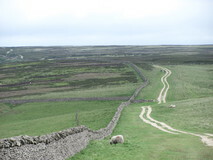 Everything since the climb up to Scarth Wood Moor had been familiar to me from the C2C, but at Bloworth Crossing we finally diverged from the C2C route, and headed off North onto new terrain. 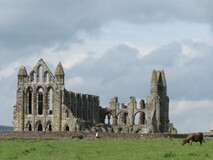 It was still a bit gloomy, but the cloud seemed to be gradually lifting. 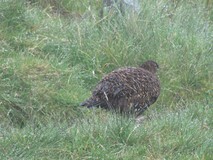 At Burton Howe we stopped for a quick snack and a small fleet of 4x4s appeared out of the gloom and drove past. 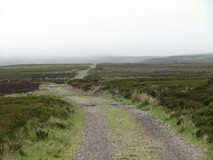 More wide track took us over Ingleby Moor and Battersby Moor, until we reached a small road that descended to Kildale. There weren't any shops in the village, but there was a small cafe that was open until five, so we headed in for a pot of tea and some lunch. The cafe was almost empty when we arrived, but a large number of walkers arrived not long after, so we timed it well. After lunch, we went and pitched up at the campsite, which was about three quarters of a mile from the centre. It was a nice spot, fairly quiet, with only a handful of tents, although after pitching up in a nicely sheltered part we noticed that there were lots of midges, so we moved the tent to a breezier field. 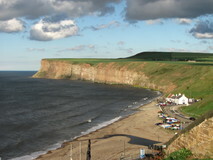 Tomorrow looked like we would make it to Saltburn, which didn't seem to have scope for camping, so we did some internet research, and booked a last minute hotel, which was a good treat to look forward to. 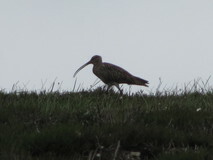 By the time we had depitched and walked back to the village it was half past eight. 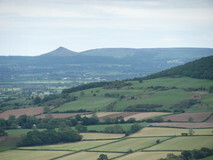 We climbed out of the village on a small road past a few cattle grids, followed by pleasant stretches through forest, which took us to Captain Cook's Monument, where there were excellent views looking ahead to the distinctive outline of Roseberry Topping. 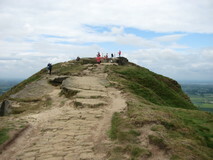 After the quiet trails, the detour off to the summit of Roseberry Topping, was more busy, and there were lots of people milling about on the summit. 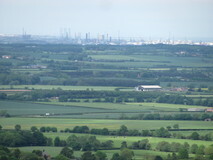 It did give superb views, out across the fields to the North, and various industrial factories and chimneys further off in the distance. 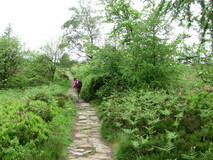 The next section took us across a moor on flagstones. We came across a flagstone that had part of an inscription on it, which seemed to be taken from a school, and then a few hundred metres later another flagstone with the rest of the inscription. 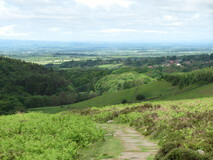 Near to Highcliffe Nab we sat on a bench for a snack, and a local mountain biker stopped for five minutes and enthused about the superb quality of the scenery, although we didn't need much convincing. 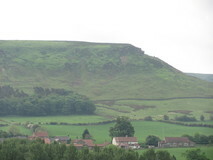 I had actually done some climbs on the small sandstone outcrop of Highcliffe Nab, a very long time ago, although it seemed a bit smaller than I remembered, and much of it was covered in some sort of very light green algae. 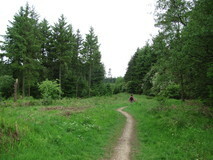 We pushed on along tracks through Guisborough Woods, then descended to Slapewath. 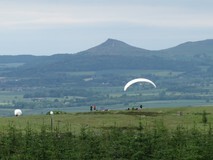 There wasn't a lot in Slapewath, mainly just a main road and a pub, but we were looking forward to a refreshment stop. Unfortunately the pub was in the middle of refurbishment work, although the chap doing the work very kindly topped up our water bottles for us. 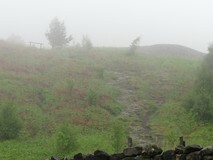 The path climbed out of the village through trees, past an old quarry. At Skelton Green, where there were a choice of two pubs, so we popped in to the first one and got a quick drink and some crisps. 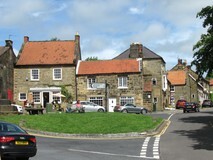 A little further on was Skelton itself, where there was a Co-op, the first food shop we had come across since Osmotherley. 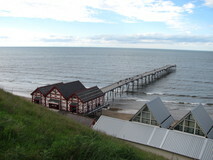 Although we were almost out of food, it wasn't that much further to Saltburn, so we pushed on. 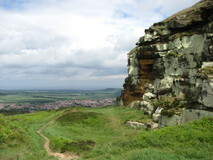 From here the path followed the wooded valley of Skelton Beck all the way to Saltburn. 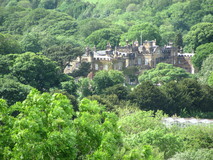 It was a lovely approach to the town, ups and downs through mixed trees, occasionally alongside the river, and strong aromas from patches of wild garlic. 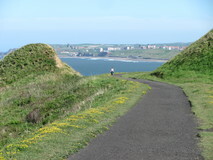 At one point the path went under an impressively huge viaduct that towered above the whole valley, before popping out at Saltburn shortly after. 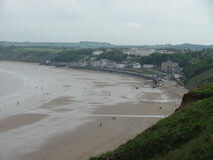 It turned out to be a nice little town, with a decent selection of shops, a pier, and a good beach overlooked by cliffs. After a look round town, we stocked up on food from the supermarket, then found a very good Indian restaurant and treated ourselves to a curry, which was an excellent change after three nights of camping stove food! The hotel did breakfasts starting at seven, so we got down nice and early, and the only other breakfasters were two women who were also doing the Cleveland Way. We were back on the trail by quarter to eight. 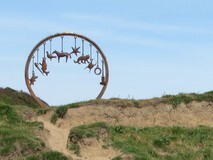 The walking took us along the clifftops, past a giant charm bracelet sculpture, and the remains of an old fanhouse that used to ventilate the ironstone mine at Huntcliff. 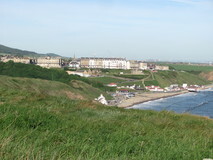 At Skinningrove we descended on a sandy path to the beach, where there was a solitary surfer out in the water, As we climbed out of Skinningrove, we passed lots of small fishing huts. At Hummersea there was a path leading down the cliffs to the beach which was closed as being unsafe, and we sat on a bench for a little while. 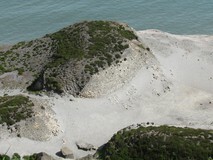 Looking down from the cliff tops we could see the remains of old mine workings. 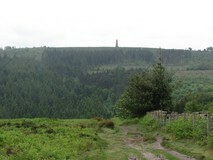 Shortly after, we passed a trig point marking the highest point on the whole of the East coast of England, at 203m. 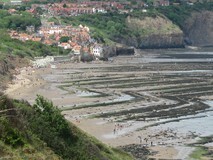 Staithes was completely hidden from view until the very last moment, and as we approached you could see the remains of the old path, much of which had fallen off the edge of the cliff. 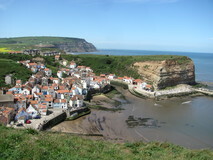 We descended the hill into Staithes and crossed the bridge over the river. It was an interesting little village, small cottages tightly packed around the river and a small beach, reminiscent of some of the places in Cornwall like Polperro. The village was busy, but we found a tiny sandwich shop which had some seats inside, as everyone else wanted to sit outside in the sun, and got a pot of tea and sandwiches. 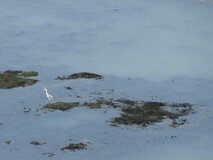 It was about quarter to one when we got going again. 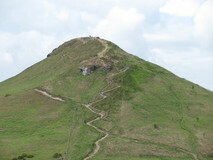 From the village, the route climbed up a narrow road, which then turned into a footpath, and at the top there were superb views looking back. 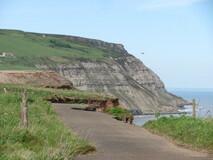 A little further on we came to Port Mulgrave, which had once been the site of an ironstone mine together with a gantry leading out onto a pier, although there was very little sign of it today. 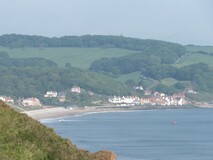 Just round the corner, we descended to the huge and quite busy beach at Runswick Bay, where the route headed across the beach itself. Strangely, despite the blue skies and sunshine a very chilly wind had started up, and there was a mix of people in warm jackets, and those who hadn't quite registered the temperature change yet and were still in just swimming costumes. At the other side of the beach, were some small caves that apparently used to have a resident goblin who could cure whooping cough. 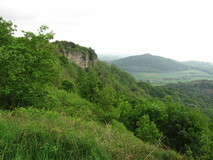 After the caves, the path turned up a small steep-sided valley, walking over shale slabs, then over a small bridge and up a steep path to get out of the valley. At the top of the valley was a well positioned seat that we took advantage of for a few minutes, then pushed on, mainly along the edge of arable fields. 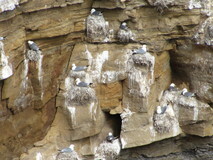 There was still a chilly wind, so we needed to put an extra layer on, although in more sheltered dips it was quite warm in the sun. Eventually we descended some steep wooden stairs down to a flat cinder track which took the route of an old railway, past old spoil piles which had grown over. 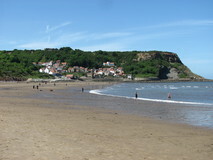 At Sandsend there were lots of children playing in a muddy pool, and the route followed the A-road out of the village, before turning off for the campsite, which was only about five minutes off route. We got there at half past five. It looked to be packed out with wall to wall caravans when we arrived, but there was another field for tents which had plenty of room. We got the stove on and had noodles for tea in the evening sun. We got going at eight. 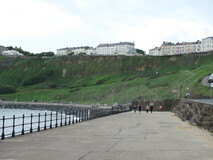 The route left the A-road and followed the cliff tops towards Whitby, past the site of an old long-gone outdoor pool, and a lift down to the promenade. 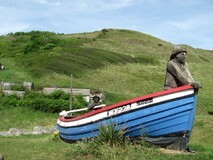 After the sculpture of Captain Cook, we dropped down to the harbour side along the river, and found a small cafe for a pot of tea and breakfast. It was already quite warm and sunny, and we had to move to seats away from the window as we were getting too hot. 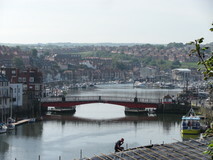 After crossing the river on the swing bridge, we passed shops selling sticks of rock of all colours, and jewellery made of Whitby jet. 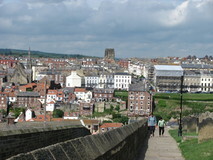 There was a short climb up the church steps, with great views back down to the town, before popping out at the remains of the Abbey. 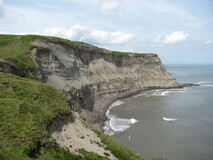 We pushed on along the cliffs, after all the quiet coastal walking, this section was surprisingly busy with people. Only a short distance from Whitby the path passed through a holiday park with static caravans, and we bought a couple of extra snacks from the small shop. 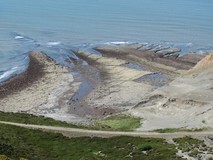 From here onwards there were great views, with some spectacular mud cliffs, very eroded in places. 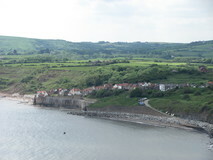 Just before Robin Hood's Bay, we passed a large party of about fifty German school children coming in the opposite direction, although they seemed more interested in their phones than in the coastal scenery. 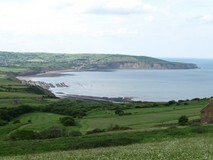 We popped out at the top of Robin Hood's Bay, and stocked up on snacks for the day and for the evening meal at the Post Office. 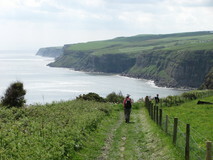 The descent into Robin Hood's Bay was busy, but not as bad as I remembered from finishing the Coast to Coast there. We adjourned to a small cafe right near the bottom of the hill, for a pot of leaf tea and houmous and olives on toast. Good food, but unfortunate timing, as a few groups had arrived just before us, so it took ages to arrive. We got going again just after two. 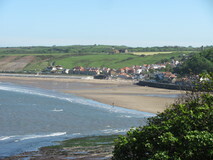 As we worked our way along the bay, there were superb views of the village looking back, and also of large bands of rock in the sand. The path shortly dropped down to Boggle Hole YHA, where there was a small cafe, which we managed to resist. 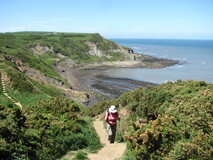 We passed through buttercup fields, then the ruins of an old Alum factory, followed by a steep climb to Ravenscar, that was hot work in the sun. 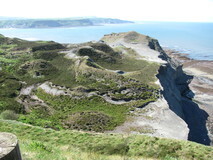 At Ravenscar there was a small cafe, so we got teas and sat down to decide where to head for. 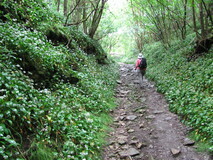 It was about five o'clock and there was a choice of heading for the nearby campsite, or pushing on a bit further and trying to find something near Cloughton, although research was hampered by lack of a mobile phone signal. 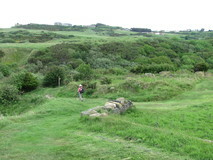 We eventually plumped for the campsite, and headed out past the old Ravenscar Railway station, which was now a cafe and B&B. The campsite was fairly basic, with loos but no showers, but it was fine for us, and a nice quiet spot, in a small field behind a farmhouse, surrounded by dry stone walls. The last day was quite long, so we were back on the path at quarter to eight. 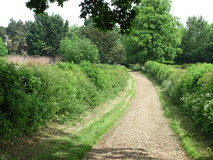 It was easy walking along a well mown grass path, past fields full of buttercups and clover. 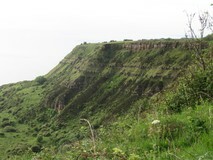 Lots of areas under the cliffs covered with ferns. One cliff had a blue rope hanging down it from a stake. We passed an old radar station built in the 1940s, with various buildings scattered about. At a small seat, we stopped and had ginger cake for breakfast. Four people passed in the opposite direction who warned us to be careful as they had just passed a couple of snakes, which we were very excited about, but sadly we didn't spot anything. 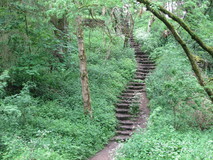 At Haydon Wyke, steps and small wooden stairs led down through trees to a pebble beach, complete with a small river and mini-waterfall. The map showed a hotel at Haydon Wyke, and we were half tempted to stop for a morning tea, but we didn't spot anything obvious so pushed on. 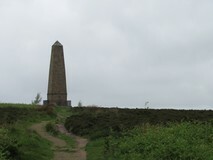 At Longnab was an old coastguard lookout, with a sign describing how it was linked to the nuclear war defences up until the 1960s. 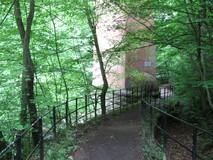 At Scalby Mills there was a path called the 'Tabular Hills Walk' that headed off inland, to meet the start of the Cleveland Way at Helmsley, to allow you do the complete circuit of the North York Moors. 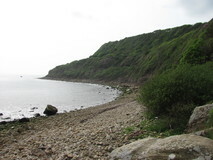 This seemed like an interesting concept, although to make it work and still complete the Cleveland Way, you would need to start at Scalby Mills, complete the loop all the way back to here, then do the last little bit from Scalby Mills to Filey Brigg, making it more of a figure nine than a loop. 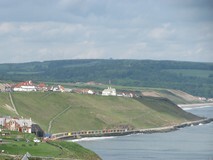 From the small headland of Scalby Ness, there were good views out across the North Bay of Scarborough, before descending to cross a bridge over Scalby Beck. 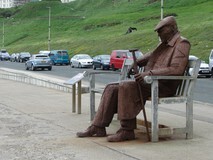 After the quiet grassy path, it was a bit of a contrast to suddenly pop out on the busy Promenade. 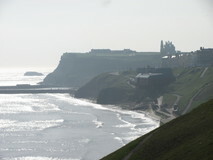 Along the promenade we passed the venue for the Yorkshire Crazy Golf Championships, and a partly dismantled chairlift. A little further along was a small cafe that was quite busy with tourists and locals, but it was an efficient operation, and our pot of tea and veggy chillies turned up very quickly. While we were sitting in the cafe, a shower passed by. 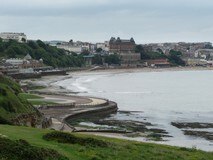 We pushed on along the North Promenade, overlooked by the castle and the hotels on top of the cliffs, then reached a small funfair beside the old harbour. 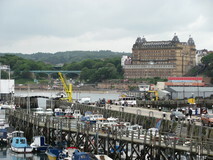 From the harbour, we passed lots of amusement arcades, and some donkeys on the beach giving people rides. 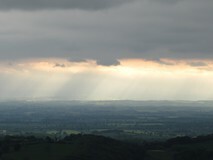 There was some drizzle, but it soon passed over. Since there wasn't much else in the way of facilities before the end, we stopped for a second pot of tea and toasted teacake at a small cafe at South Cliff. After South Cliff there was a bit of a climb away from the promenade, and a female coastguard had parked up her pickup truck and was doing some training running up and down the hill carrying a large tyre. 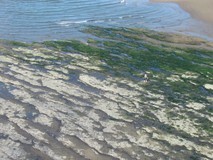 Passing Caytoun Beach we could see a load of surfers out. 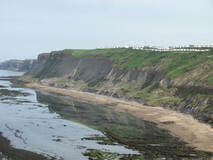 At Gristhorpe Cliff there was a patch of sea below the cliffs that was trapped by a rocky band, and the water was dead flat, with superb reflections of the cliffs above. It seemed to take a while to reach the end, the path passed lots of caravans, and you couldn't see the finish until the last moment. 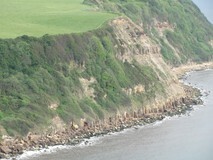 But we finally made it to Filey Brigg for quarter to six. 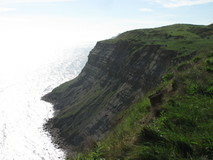 The last time we were here, at the end of the Yorkshire Wolds Way, everything had been shrouded in mist, but this time it was clear, and there were good views of the Brigg and of Filey itself. 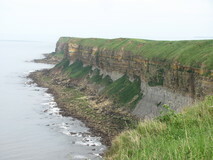 There was a campsite only a few hundrede metres from the Brigg, and we popped over. As it was a Friday it was quite busy, but luckily they had one free space so were able to squeeze us in. 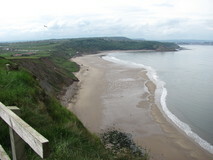 We walked into Filey and got some chips to celebrate. 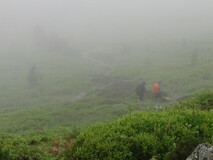 During the night it rained very heavily, which was actually perfect timing, now we had completed the walk. The total mileage is a little shorter than that quoted in the book because we skipped the white horse detour on the first day - rather poor show I know, but we were a bit rushed after the late start! Although as it happened we would have been fine arriving at High Paradise Farm an hour or two later. 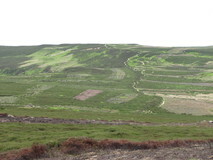 If you have enough time on your hands, a very interesting option would be to add in the Tabular Hills Walk at the start, to give a complete circuit of the North York Moors!